Spoon half of the yogurt into the bottom of two small, clear glass or plastic cups. Stir the almond extract into the whipped topping. If you don't like almond extract, feel free to omit this step. Spoon half of the whipped topping over your yogurt layer. Add a second layer of yogurt, then whipped topping. Chilld until ready to eat. Serve with a spoon and drink umbrella. Enjoy! We've got record temperatures already rocking their way through our summer days, so who wants to turn on their oven and toast up a steamy dessert? Not I.
I also won't mention my dread at this point in the post over the whole bikini season thing. Good gracious, how did summer sneak its way onto the calendar already? To combat both the rising temperatures and growing hips in these parts of my country, I tossed together a snack. Because nobody should have to live without dessert. Even if it is nearly a hundred degrees outside. Even if I can barely breathe for the tightness of last year’s swimsuit. 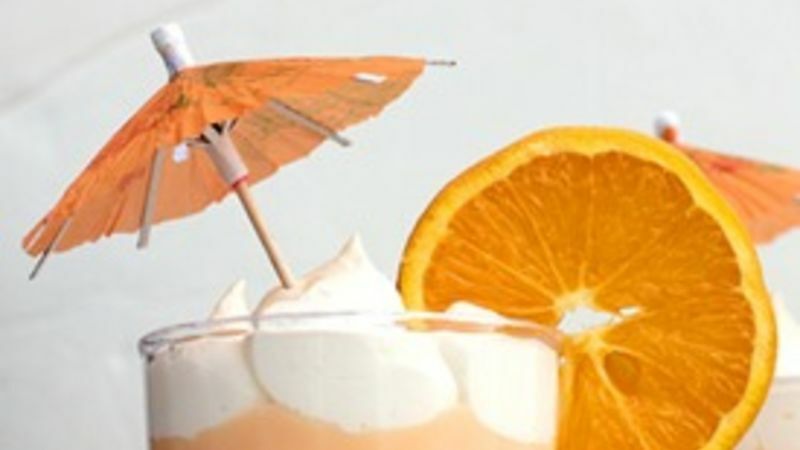 This Orange Creamsicle Cups recipe is a simple take on favorite summertime flavors. Yoplait Light yogurt offers up an Orange Creamsicle flavor. The yogurt by itself is gorgeously delicious. But, just you wait until you fancy it right on up. A dollop or two of light whipped topping layered in a cup make this recipe about as simple and splendid as anything. You feel as though you've spooned a decadent treat into your boca, without even the least bit of a guilty sweat. Now that is what summer is all about. Brooke blogs at CheekyKitchen.com where she shares fun family recipes. She joined Tablespoon to share some of her best, so keep an eye on Brooke’s profile to see what she cooks up next! What's your favorite light summer treat?